Do you care for a child or young person with a learning disability, autism or both? Have you ever raised a concern or a complaint about the education, health and social care services they receive? And you have been left feeling frustrated by the response you received? Then you may well be interested in NHS England’s Ask, Listen, Do project which Cerebra is now involved with. The project is aimed at supporting organisations to learn from and improve the experiences of people with a learning disability, autism or both, their families and carers when giving feedback, raising a concern or making a complaint. The project includes the development of resources to support good practice in organisations across health, education and social care, and guidance for people, families and carers so that they feel empowered and confident to speak up. Seven out of ten people said that they did not feel that their complaint(s) had changed the way the organisation supports people as a result. As a result of the survey Ask, Listen, Do realised that feedback, concerns and complaints systems (and safeguarding and access to justice) do not seem to work as well as they should across education, health and social care for children and adults with a learning disability, autism or both and their families. That reflects in part their journey through many complex systems in education, health and care and the many barriers and difficulties they face. The systems and processes are also very complicated. There is also not a good enough understanding about how to listen to families or children, young people and adults, and the reasonable adjustments needed to do that. People and their families are often not included or do not feel that feedback and other systems work for them and do not take part in them. It must also acknowledge a perception that sometimes families can be seen as difficult and challenging, which can get in the way of organisational listening and learning. 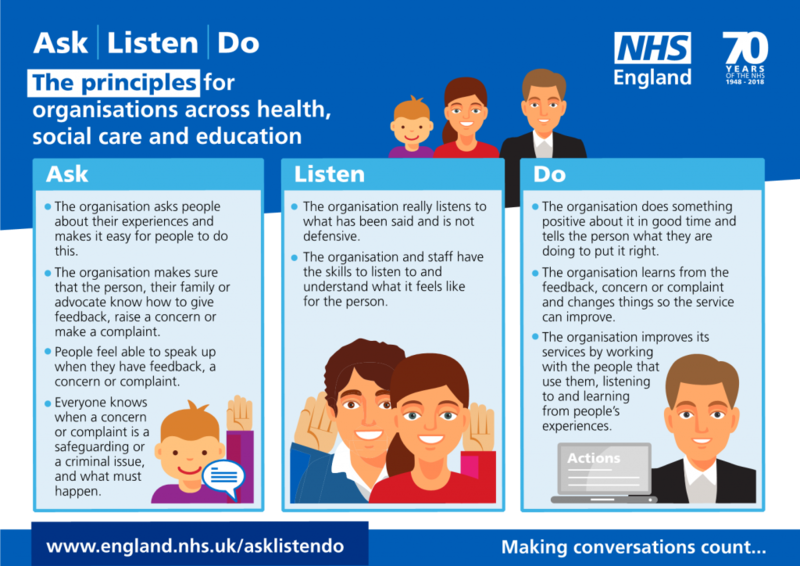 Ask, Listen, Do are seeking to influence and change organisational behaviours and approaches through the Ask., Listen, Do approach and the help of families, carers and national partners in education, health and social care. 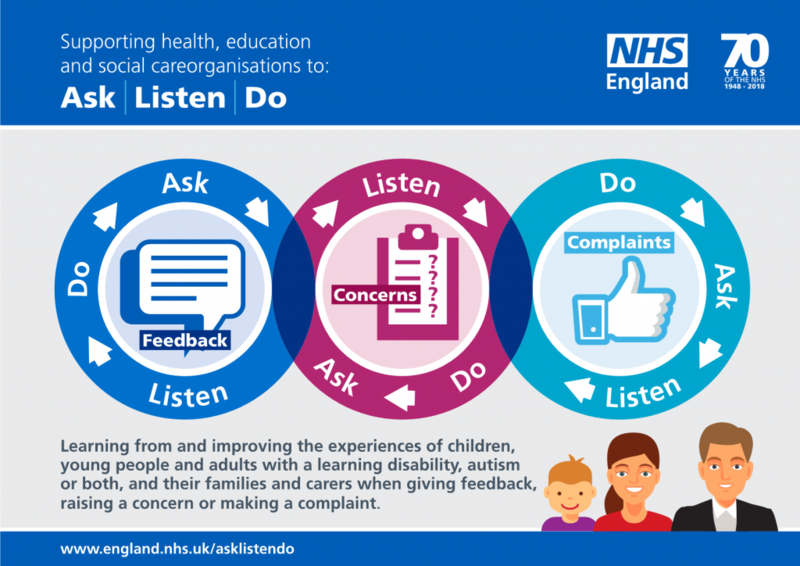 One example already achieved is that NHS Improvement will include Ask, Listen, Do in their new learning disability standards which is to be issued soon. Another example is that the Department for Education commissioned Whole School SEND to work with families and NHS England to coproduce a guide to help make conversations about their children and young people count for all families in all schools. This can be found here. They have also produced a Top Tips leaflet for families to help empower them in understanding and dealing with these complex systems, and training and other resources to support organisations. The project is now launching on social media at #AskListenDo and you can find out more about Ask Listen Do on their website. I would love to be a part of this.!! I have two children with SEN and also work in a school working with SEN children and there families. My experiences have been both traumatic and a constant battle. How can I become involved?. Hi Jenny. I’m glad you found this article useful. If you drop [email protected] an email, he will be able to advise you a bit more about how Cerebra is involved with the project and how you can be involved. I would love to take part. Is it only for England because I live in Wales? I no a lot of parents from my sons special school who would be very interested. Hi Melany, if you email [email protected], he will be able to advise you on how you can get involved.